It’s always fun to check in on Craftster and see what’s trending. For a while it was Steampunk, then cupcakes, and even mustaches took a trendy turn. Yesterday, it was evident that, for now anyway, prehistoric crafts are IN! 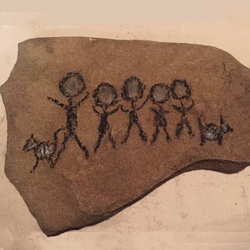 “alteredsabertooth” discovered a unique way to carry a reminder of her loved ones with her wherever she goes: she took a fire stick and rendered a portable family portrait. What a handsome clan! Tired of drinking straight out of the river? 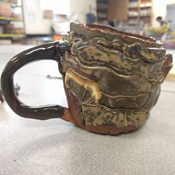 Get inspired by “PerfectPaleontologist” and make a handy drinking vessel out of mud. Need a yummy treat? Make sure you try this ancient recipe, courtesy of “Mistress Paleozoic”. 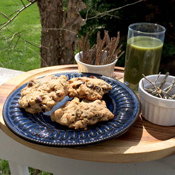 Mmm, Rock Cakes. Going out for a night on the range? 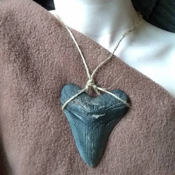 Dress up your fur with a lovely tooth necklace, like this one, by “primordial”. Lovely! You might like some earbobs. 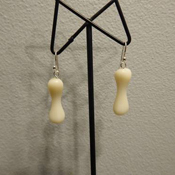 “MissingMammoth” made some bone earrings. It’s great to be inspired by things you have lying around the cave. Jump on the prehistoric bandwagon, and enjoy the simple things. PS. Did you have a nice April Fools Day? We did. IT WAS THE BEST MOST FUN EVAR!